Incidentally, when I last looked at that listing, about a month ago, ten were in stock, now four. I don't know, however, if it would support a 7"; possibly. It supports that longer 6" telescope quite well. As it is, a 6" Maksutov comes with a rather lengthy acclimation period, not to mention the focal-length; a 7" would naturally take and be longer, respectively. I had a skywatcher 6" Mak. It was great optically. I tried it on a NEXSTAR Mount designed for an 8" SCT but I found the MAK wobbled too much for me to enjoy using it. The 6" Mak was most happy on my CG5 mount, so my expectation would be that it wouldn't matter if you used a 6" or a 7", you'd still need to use your SVP. A one armed Alt AZ mount is not likely to be beefy enough. Thanks, Muse. Maybe the smart thing would be to figure out how to disassemble my ETX125 5" Mak without destroying it, find some rings for it and give that a try. It always was optically excellent. Mechanically and electronically is a different story, but it did work as well as those things do. Anyone got a link to ETX disassembly instructions? Edited by JoeBftsplk, 09 November 2018 - 10:54 AM. I had the AT Voyager branded version of this mount and It worked very well with my MK-67 6" Mak, I particularly liked the slow motion knobs, this was my grab and go rig for years. I don't think the AT Voyager could support the weight of the 7" Mak, although I have no data to back that up. I also don't think I would be happy with the performance of a 6" Mak on a Porta Mount, as the Porta has a lower weight capacity than the AT Voyager. In fact, I would not put a Makustov over 5" on the Porta. My 6 inches Mak was very stable on my Skyview Pro, but I intend to go Altaz. I will purchase a Skytee 2 (rated 13 kg). The lighter ones are very attractive (especially the one shown by Sky Muse) but don't look sturdy enough for me, I have been used to rock solid! Well I got the ETX off its fork mount. Wasn't hard, I don't think I hurt it any. I'll order some rings and a dovetail and give the ETX a try on the Porta when they come in. If it works well, I'll have another grab-and-go rig. If it works really well, I might still buy a bigger Mak to use on the SVP. Happy to get the ETX going again. It's about 20 years old and hasn't been used for over a decade. Used to really like the sharp images it would put up at high magnifications. Edited by JoeBftsplk, 09 November 2018 - 08:25 PM. BTW, from reading another thread I discovered that Orion puts the mounting dovetail on their Maks on the bottom of the scope tube. This would put the finder bracket at about the 7:30 position (near the bottom) of the scope if the dovetail is attached to a sidearm mount like the Porta. My own is the Astro-Tech Voyager I. I got it back in 2006 or '07, or perhaps before then; I really don't remember as it's been so long. I had gotten the pier and the eyepiece-tray for it as well. Someone at Astronomics wanted to give me a discount on the tray, as it was used, according to them, but I couldn't tell that it was used, so I refused the offer. Great! They're sure cheaper than Parallax rings. Guess I'll give 'me a try. I also had the pier and eyepiece tray, I picked the mount up at NEAF, on Sunday but cannot remember the year for $175 new... I miss that mount. I ended up with a WO EZTouch, which is now made by AKO Swiss. I was a little hesitant about not having slow motion controls, but this mount is easily adjustable and the movements are so fine, I can easily observe above 200x with out slow motion controls. And I can load up a second scope for wider field viewing, this is my current "grab and go". My 180mm Orion mak works in my Porta II, but I’ll only use that set up for a quick look and not all night. My mak is insulated and difficult to mount sideways in the Porta II, but it works. A 5” or 6” mak would likely work much better, but I agree what everyone else on this thread is saying - better to not undermount such a fine scope. The Porta II is such a versatile and easy to transport and use mount, I should have picked one up much earlier. 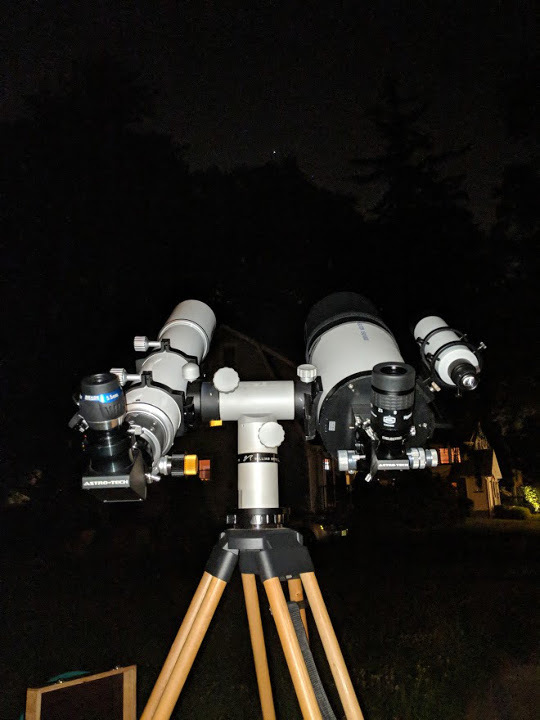 I can’t keep my mounts out and extended because I don’t have the space at home, but if I did, I would get a dual-Scope alt-az like the ES Twilight II or Omegon dual-scope mount. Those would hold the mak and a wide field refractor just fine. I have had the privilege of owning both the 6 and 7" Orion Maks. The 7" is much larger and heavier. Optically they where both excellent. If I was limited to a lighter mount I would defiantly go with the 6". I used it on a twilight 1 and it worked relatively well. There was no way that the 7" would ride on that mount. My LXD75 was barely sufficient for the 7". Best, Vlad. the 6 will give a much wider field of view and be more portable. i own the 7 inch sw and its a fantastic instrument optically but f15 restricts it for dso's. I agree that the f.o.v. is wider in the 150 f/12, but I wouldn't characterize it as "much wider." Second, there are many DSO's that fit nicely in the f.o.v. of both of those Maks. Just to name a few: M1, M2, M3, M5, M13, M27, M51, M57, M80, M81, the Trapezium in M42.... There are also DSOs that won't fit the f.o.v. of either one of them. But in general, there are more DSO's that fit, than ones that do not fit. Let's compare objects viewed at similar brightness. The 180mm Mak, with an Ethos 10mm ep. has an exit pupil of .67mm. So each Mak will show all of the above listed DSOs (and many more) in their entirety with equal brightness. But the 180mm Mak will show those objects at 270x Magnification while the 150mm Mak will yield only 225x Mag. Advantage: the 180mm Mak. Let's compare objects viewed at similar magnifications. 180 Mak with a Delite 13mm ep. has a magnification of 207x and an exit pupil of .87mm. 150 Mak with a Delite 9mm ep. has a magnification of 200x and an exit pupil of .75mm. 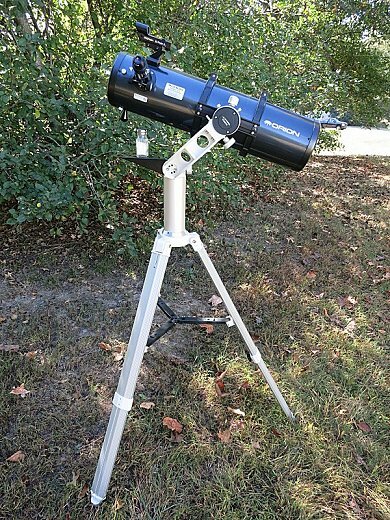 The DSO will appear brighter in the 180mm Mak at the same magnification. Advantage: the 180mm Mak. I'm not saying that under all circumstances DSOs will look better through the 180mm Mak, but in most cases, that has been my experience. In addition, the 180mm Mak will have a noticeable (but not overly dramatic) edge when viewing the planets and the Moon. Nicely put however the potential field of view in the 1800mm fl 152 is 50% wider than the 2700 mm 180. To me that makes a difference. I have a 6 inch f5 SW newt with 1.25 inch focuser and its much wider of course than either I would love to compare the mak to the newt which has excellent optics. I use a 31mm Baader hyperion in the Mak and its very good on DSO's in general but some of the bigger southern objects don't really fit in the field of view. Yes the field of view of the 6” is wider but the extra light grasp of the 7” makes it the better pick - and I’ve had three of these scopes - under dark skies quite a few galaxies are within its grasp and I found it gave quite a nice field with a 38mm 70 degree SWA or 40mm Paragon. 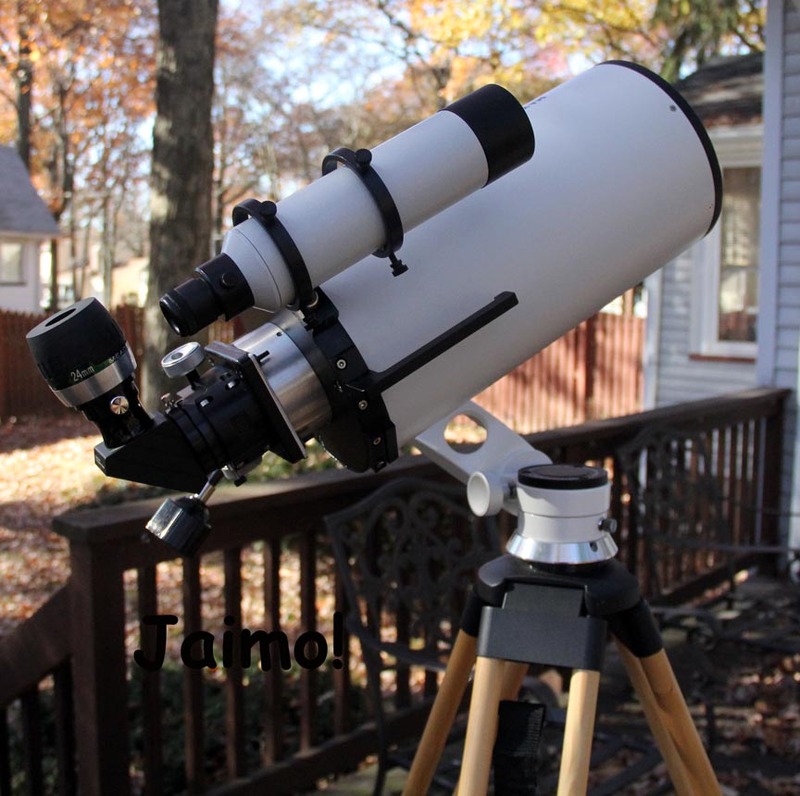 But if you really want wide and image quality you should try to find a secondhand Intes or APM Maksutov Newtonian, the last ones were made about 2-3 years ago and occasionally one comes up for sale - a beautiful APM 8” sold a few weeks ago and there’s a 10” if you have the $$$. At the moment they seem to be somewhat unloved and underrated but well worth having if you can find one. Edited by luxo II, 19 November 2018 - 04:47 AM.